According to recent estimates, more than 125,000 sexual assaults occur each year in the United States. “Emergency physicians (EPs) work closely with law enforcement in sexual assault cases because these victims often present to EDs for evaluation,” says Margaret K. Sande, MD, MS. “Documentation and testimony in sexual assault cases from EPs is valuable for the prosecution of offenders.” She adds that studies demonstrate that accurate and thorough documentation of sexual assault injuries correlates with higher rates of charges filed and successful convictions of perpetrators. The American Board of Emergency Medicine’s Model of Clinical Practice of Emergency Medicine includes the assessment of sexual assault and completion of examinations for these events as integral topics and skills during the training of emergency medicine (EM) residents. However, Dr. Sande says there are no nationally recognized recommendations on the number of hours or content that should be dedicated to training. She notes that some EM residents may not feel properly prepared to perform the complex forensic examinations often required for sexual assault patients. Over the last 35 years, sexual assault nurse examiner (SANE) programs have been established to improve the quality of care for sexual assault victims. Throughout the country, these programs have quickly become the model of care for assault victims, but few analyses have explored how they impact EM resident training. In a study published in the Western Journal of Emergency Medicine, Dr. Sande and colleagues gathered information from program directors of EM residency programs in the U.S. to assess current training for the care of sexual assault. 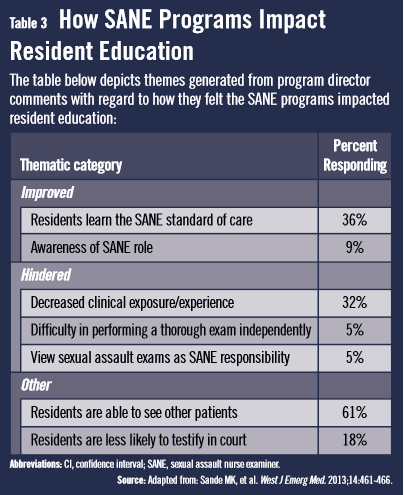 They also surveyed program directors on their views of the overall impact of SANE programs on EM resident training. 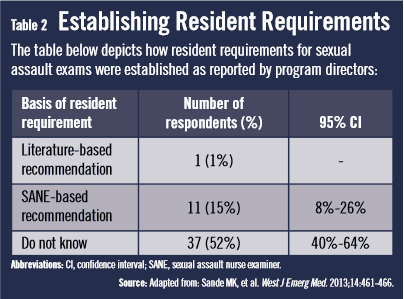 According to findings, nearly one-third of program directors reported that their residency did not require procedural competency for the sexual assault exam (Table 1). Another 41% reported that their residents were required only to observe the completion of sexual assault exams in order to demonstrate competency. When residency program directors were asked how their programs established resident requirements for sexual assault exams, 52% did not know how these requirements were established (Table 2). Sande MK, Broderick KB, Moreira ME, Bender B, Hopkins E, Buchanan JA. Sexual assault training in emergency medicine residencies: a survey of program directors. West J Emerg Med. 2013;14:461-466. Available at: http://escholarship.org/uc/item/2zk3d6m6. Campbell R, Patterson D, Lichty LF. The effectiveness of sexual assault nurse examiner (SANE) programs: a review of psychological, medical, legal and community outcomes. Trauma Violence Abuse. 2005;6:313-329. Wiler JL, Bailey H. The need for emergency medicine resident training in forensic medicine. Ann Emerg Med. 2007;50:733-738. McLaughlin SA, Monahan C, Doezema D, et al. Implementation and evaluation of a training program for the management of sexual assault in the emergency department. Ann Emerg Med. 2007;49:489-494. Young S, Wells D, Summers I. Specific training in clinical forensic medicine is useful to ACEM trainees. Emerg Med Australas. 2004;16:441-445. Margaret K. Sande, MD, MS, has indicated to Physician’s Weekly that she has or has had no financial interests to report.